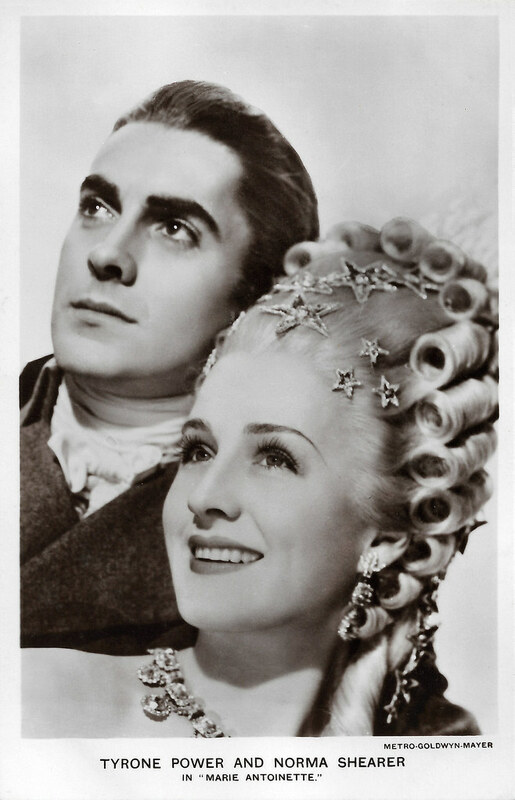 From Flickr: “Tyrone Power and Norma Shearer in Marie Antoinette (1938)” by Truus, Bob & Jan too! British Real Photograph postcard in the Film Partners series, London, no. P 254. Photo: Metro-Goldwyn-Mayer. Publicity still for Marie Antoinette (W.S. Van Dyke, 1938). Beloved Hollywood star Tyrone Power (1914-1958) may have been all-American, but he sure loved European ladies. He was married to both French Annabella and half-Dutch Linda Christian. American actress Norma Shearer (1902-1983) was the ‘First Lady of MGM’. She won a beauty contest at age fourteen. In 1920 her mother, Edith Shearer, took Norma and her sister Athole Shearer (Mrs. Howard Hawks) to New York. Ziegfeld rejected her for his Follies, but she got work as an extra in several films. She spent much money on eye doctor’s services trying to correct her cross-eyed stare caused by a muscle weakness. Irving Thalberg had seen her early acting efforts and, when he joined Louis B. Mayer in 1923, gave her a five year contract. He thought she should retire after their marriage, but she wanted bigger parts. In 1927, she insisted on firing the director Viktor Tourjansky because he was unsure of her cross-eyed stare. Her first talkie was in The Trial of Mary Dugan (1929). Four films later, she won an Oscar in The Divorcee (1930). Norma Shearer intentionally cut down film exposure during the 1930s, relying on major roles in Thalberg’s prestige projects: The Barretts of Wimpole Street (1934) and Romeo and Juliet (1936) (her fifth Oscar nomination). Thalberg died of a second heart attack in September, 1936, at age 37. Norma wanted to retire, but MGM more-or-less forced her into a six-picture contract. David O. Selznick offered her the part of Scarlett O’Hara in Gone with the Wind (1939), but public objection to her cross-eyed stare killed the deal. She starred in The Women (1939), turned down the starring role in Mrs. Miniver (1942), and retired in 1942. Later that year she married Sun Valley ski instructor Martin Arrouge, eleven years younger than she (he waived community property rights). From then on, she shunned the limelight; she was in very poor health the last decade of her life. For more postcards, a bio and clips check out our blog European Film Star Postcards. From Flickr: “Charlie Chaplin and Jackie Coogan in The Kid (1921)” by Truus, Bob & Jan too!